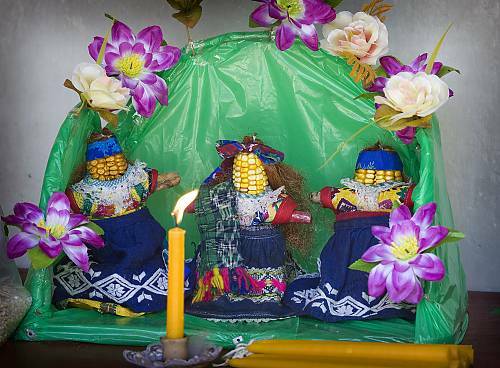 The Paach ceremony is a corn-veneration ritual celebrated in San Pedro Sacatepéquez. The ceremony gives thanks for good harvests in a ritual that highlights the close connection between humans and nature and features prayers in the Mam language. The participants are mostly older farmers, both men and women, with extensive ties to the community and who are recognized as its leaders. 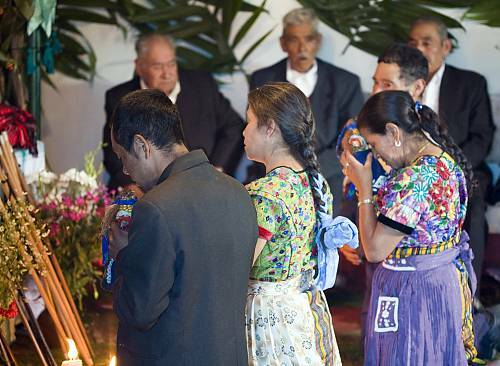 Four prayer sayers, or parlamenteros, offer prayers during the ceremony, supported by four auxiliary parlamenteros; meanwhile four godmothers dress ceremonial corncobs and coordinate the preparation and serving of food. The Paach ceremony strengthens the identity of the community of San Pedro and its knowledge and respect for nature and its conservation. The transmission process is both oral and practical, with a group leader instructing new members at workshops and children accompanying their grandparents during the ceremony. In recent years, the Paach ceremony has decreased in frequency, with some young people seeing it as irrelevant, while economic insecurity has caused some bearers to withdraw from the practice. Furthermore, the advanced age of the elders, combined with diminished transmission, might result in the disappearance of this cultural expression. Paach ceremony is an ancient tradition of the Maya people, its purpose is to thank mother earth (nature) and the sacred corn because this keeps the life of the people. This is based on the Popol Vuh, the sacred book mayan-K'iche', to the same stresses the importance of corn in the creation of the first human beings, according to the Mayan philosophy. "The meat was only made of yellow maize, white maize, human legs and the arms were made only of the paste of the corn; this was our parents, our grandparents. "Popol Vuj (SAM 2011). The candidature of this ceremonial start in the year 2009 and ends in the year 2013 when it belongs to the list of urgent safeguarding. This request responds to the problem of transmission that is at risk and vulnerability of the carriers of culture is high. The main objective of safeguarding the demonstration is to preserve the cultural principles of coexistence of human beings with nature, which makes it sustainable life of people and their environment. This essence of the cultural manifestation fades easily in the everyday lives of the people, who are outside the same although in their privacy maintained a ritual of thanks to maize by the power and strength that gives them. In recent history, the internal armed conflict of more than thirty-six years is one element that should be considered as it will leave deep traces in the free expression of the people, who in the struggle for life migrated to the United States or to the capital city. This condition causes the sociocultural dynamics ceases to be transmitted properly and in the struggle to preserve their life stop practicing this type of ceremonial, or do so secretly, in the privacy of their homes. For this reason, the entry in the list of urgent safeguarding the Ceremonial of the P'aach opens a door to the private and community culture recognizes and values the contribution of all the carriers of culture, who in the silence and privacy were still practicing this ceremonial. The participation of children, youth, adults and elderly people who dance to the pachitas, as they are commonly called in San Pedro Sacatepequez, San Marcos, evidence is achieved from the development of the inventory of Intangible Cultural Heritage of this ceremonial. 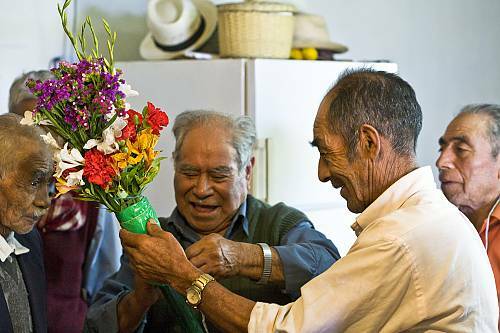 The Pregón is a risk of transmission and permanence given that only one group is being carried out at the moment, there are older people who do not speak their mother tongue the maya-mam. Although attempts have been made by count with a group of people who go acquiring the knowledge of the proclamation and treats the same, it becomes a little difficult by the lack of identification of persons with this part of the cultural manifestation. Strengthen the process with the local participation has been the backbone of the work generated during the first year after registered the cultural manifestation. Social unrest is a constant that has managed to go on and that finally give a space to find and build from their differences, their interests and common elements. The actions developed have initiated an action from the carriers of culture who have shaped work tables have them achieving leadership within these proposals. The Ceremonial of the P'AACH is a ritual of veneration of the maize that highlights the close relationship between human beings and nature, the same is respect and conservation to the nature. In this ceremonial involved speakers called parlamenteros who then delivered prayers in Mayan language-mam. The godparents who are responsible for dressing the pachitas "corn cuache" and who along with the men the show and dance. The participants are elderly men and women, adults and young women and girls, each one plays a specific role within the ceremony are the elderly and those who lead the entire activity. It is also located a group of musicians who play instruments such as the marimba, the drum and shawm. This ceremonial not only form an integral part of the heritage and cultural identities of the Mayan people-mam of San Pedro Sacatepequez, but also of those who live in other communities in the municipalities of Comitancillo, Nueva Cabrican plantation and San Pablo. 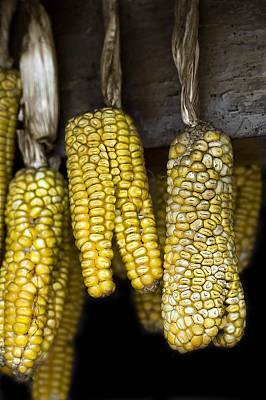 Within the ceremonial develop knowledge and skills that are interrelated with the technique of collection, production and consumption of the corn which reflects a historical connection, which is maintained in the collective memory of the people, that assumes the corn as their main food. 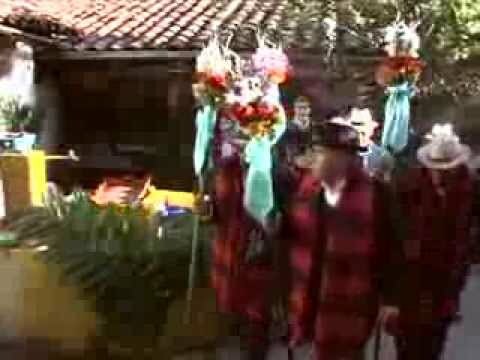 In the Ceremonial of the P'aach combine two key elements such as The Pregón and the dance of the pachitas. 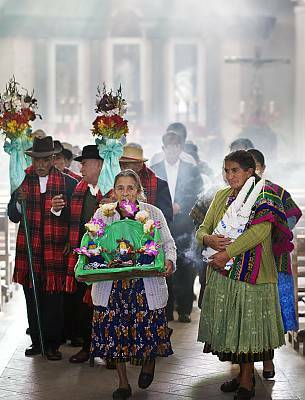 In this sense the pachitas is still transmitted inter generacionalmente some from the gaze of the Mayan spirituality-mam and others from the Catholic church in a religious syncretism generates prayers and rituals, own. Within the safeguard measures that the communities have developed are the celebrations at the family level and other registered in the actions of the Catholic church, this is the case of San Francisco Soch where girls and boys in a brotherhood organized dance the pachitas one week before the celebration of the fourth of october, and the adults will be celebrating the fourth of october participating young people, adults and the elderly, who dance the pachitas and prepare all the elements that requires this ceremonial. In the case of San Juan del Pozo ritual is performed in the framework of the agricultural calendar maya that starts with a Mayan ceremony, in the participating communities maya-mam both the Municipality of San Pedro as elsewhere, organizes the food and shares the seed corn. The Pregón is maintained by members of the group mother corn Pro, who have not achieved transmit their knowledge to their children, and given their age and lack of proficiency in their language becomes more difficult to meet this situation. Racism and Discrimination have been a structural factor that leads to the loss of value of the Mayan culture-mam and hence the use of language as a vehicle for transmission of these knowledge and wisdom. Historical situation given that General Justo Rufino Barrios (1848) decreed for the population of San Pedro San Marcos as ladino, prohibiting use of the maya mam language. The strongest threats that need to be addressed is the transmission of The Pregón in mam language, this is because there is no favorable conditions for the recovery of the given language institutional interconnection that is very weak, the Academy of Mayan Languages of Maya-Mam region is Linguistic Guatemala-Comunidad develops its work without interconnect with the Ministry of Education, which in turn has the Bilingual Education Program, both institutions could be the heed the strengthening of the use of the language and therefore the learning of The Pregón. Started with the processing of a letter of understanding with the Ministry of Culture and Sports and the Ministry of Education to children as part of the school curriculum are aware of The Pregón and motivate them so they can get by purchasing a domain name for your language and therefore of the proclamation. Another threat is the dispute that have local cultural organizations that are looking for the leading role of the cultural manifestation and want to take the definitions of the work without prior consultation with the carrier of culture. The Ministry of Culture and the Municipality of San Pedro maintained the principle of active participation in the decision-making of the carriers of culture, which generates a social conflict that you are working on. In 2002 the Cultural Association Nan Jal (mother ear) submitted to the Ministry of Culture and Sports, the request for declaration of Intangible Cultural Heritage of the Nation of the Ceremonial of the P'Aach. In September 2009 begins the process of formulation of the candidature promoted by the cultural association Nan Jal (Mother Cob), the Ministry of Culture and Sports and with the advice of UNESCO Guatemala. It was attended with the consent of the standard-bearers of the culture committee organized in the Pro Mother Corn. During the process (2011) were disadvantages between the carriers of culture and the Association Nan Jal, which led to remove to this organization of the accompaniment of safeguard actions. The Ministry of Culture and Sports and the Municipal Government of San Pedro Sacatepequez, maintained their accompaniment and were integrated into the process to other organizations such as the Academy of Mayan Languages and Fraternity Shecana. In December of 2013 it is included in the list of urgent safeguarding of the Intangible Heritage. 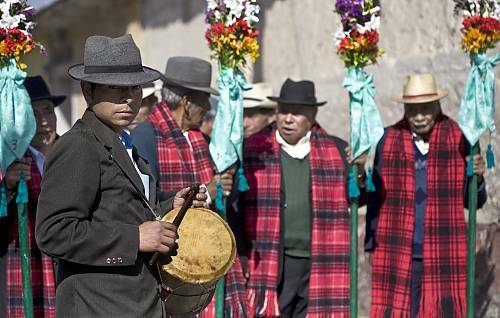 In 2014 conducted an inventory of the ceremonial, successfully identifying groups of carriers of the culture that argue the dance of the pachitas, not so The Pregón. This ceremonial requires an understanding of the measures to safeguard that has implemented the Maya people-mam, in the ceremonial ritual called the P'aach, which involves two aspects, on the one hand The Pregón and the other is the dance of the pachitas. The first is associated with the use of the official Pregón as a tool to give thanks to the Creator the product born of the earth, this has a temporality that is interrelated with the agricultural calendar maya. The second is the dance of the pachitas that relates to the harvest and the conservation of the grain of maize landraces, which has allowed us to maintain the biodiversity of the corn in Guatemala. This ceremony is the integrity of the logic that governs the production system and the transmission of knowledge associated with this ritual. One of the threats to this ritual are the development projects that threaten the genetic material that have been preserved Mayan communities in Guatemala. During the year 2014 is established by the law decree 19-2014 Monsanto whose objective was to ensure the exclusivity of intellectual property rights as applied to seeds. Patents granted to individuals or juridical persons national and international, of any member country of the International Union for the Protection of New Varieties of Plants (UPOV), which can hijack the genetic heritage tangible and intangible. After a long struggle of the civil society represented and the primitive peoples, was repealed the law. The pressure is maintained at the national level through projects that have been causing the promotion of the use of these materials and the sale of the product at minimum prices, delivery of agricultural inputs that affect not only the genetic material but the friendly agricultural practices with the environment that practiced by the Maya of Guatemala in the highest areas of the country. 1. Inventory of Intangible Cultural Heritage of the Ceremonial of the P'aach. • Identification of carriers of culture at the municipal level that still maintain the cultural manifestation. • Working meetings to organize the inventory of intangible cultural heritage of the demonstration. • Systematization of the documentation collected and work in communities, achieving the preliminary document that was validated by the group of carriers of culture and local organizations that accompany the process. • Geopositioning of las cruces that integrate the path of the ceremonial. • Inventory space inherent in the cultural manifestation. 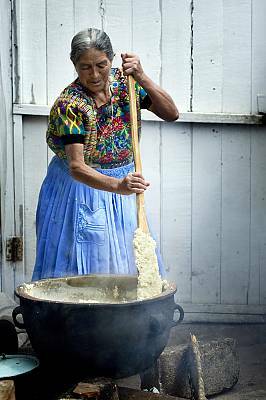 During the inventory process is accomplished the identification of other carriers of culture, which gender concern on the part of the members of the group Mother Corn Pro in regard to the representativeness of them to UNESCO. This led to tensions that finally they managed to overcome, leaving clarity in regard to the intellectual property of the communities in relation to the cultural manifestations and the role that those who presented the nomination to UNESCO. 2. Recognition and establishment of las cruces as elements of the cultural manifestation. • Review documentary about the location of las cruces, number of the same and their names. • Municipal Agreements for the construction of the crosses on the places determined by the standard-bearers of the culture of the group Pro Mother corn. • The municipality conducted the negotiation with the owners of the land where are located the crosses. • Establishment of las cruces. The people of the community where the Oratory is located one of the crosses was not agree with the construction of the same, because they wanted to build the home of the mayor community. 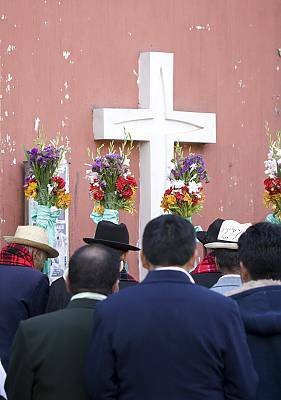 Given that the hill where the cross is located is also a place to make Mayan ceremonies, spiritual guides and population of the community and other communities have asked the municipal government stop the work because it is part of the cultural heritage of the people cannot be destroyed. In this case was opened the intra-community negotiation and the municipality stopped the work, a situation that is not yet firm already that the municipal council is pending a final resolution. 3. Identification of new members for The Pregón. • Analysis of the transmission mechanisms that apply the bearers of the Mayan culture-mam. • Workshops for analysis and reflection of the cultural transmission. • Identification of young people to teach the proclamation on the part of the standard-bearers of the culture of the group Mother Corn Pro, in the community the greatness. achieving the objective, given that the people that were convened by the carriers of culture requesting financial support for their children. This kingdom to the analysis of the way in which knowledge is transmitted from the peoples generates a gap that leads to rethink the strategy of working with the population of San Pedro Sacatepequez in regard to the identification of new leaders for the proclamation. There is an internal problem of the group Mother Corn Pro in terms of decision-making that led to a division of the group, a situation that was addressed by mediating the Ministry of Culture and Sports. The solution to the conflict is in the process. 4. Groups of carriers of culture. • Municipal Assembly of the authorities in the community of San Pedro Sacatepequez San Marcos. • Meetings to establish agreements with the groups carriers of the culture of the communities of San Francisco Soch, San Juan del Pozo, the greatness, municipality of San Pedro Sacatepequez. • Municipal Agreement to provide financial support for the activities of the Ceremonial Group Pro the Corn Mother and the Community of San Juan del Pozo. • Joint Celebration of the Proclamation and the dance of the Pachitas with the Committee Pro Mother Corn and the San Francisco group Soch. • Celebration of the dance of the Pachitas in San Juan del Pozo, participating groups of carriers of the culture of other communities and municipalities, as Comitancillo, Nueva Cabrican plantation, San Lorenzo. 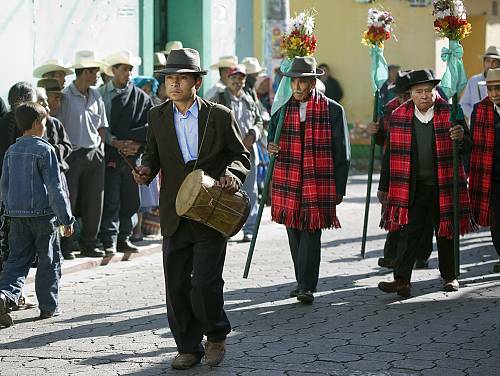 Currently, it has achieved greater participation of the representatives of the groups of carriers of other communities that together to Pro Mother Corn, have kept the ceremonial for hundreds of years. 5. Management for the strengthening of safeguards activities. • In March of 2014 a proposal was drafted to document project that involved the preparation of educational materials for girls and children from primary level pre and primary, the same was submitted to UNESCO. • The team of UNESCO - Paris considered the importance of analyzing the proposal, by what supports us in identification and accompaniment of an expert on the subject of Intangible Heritage. Ms. Soledad Mujica, peruvian organizes expert technical assistance in coordination with the technical direction of Intangible Cultural Heritage, the Municipality of San Pedro Sacatepequez, San Marcos, who in turn coordinate in-house with the carriers of culture. • The analysis workshop and establishment of the project idea is performed in November of 2014, successfully identifying actually require educational materials, but that the actor that is sorely missing in action is the Ministry of Education, as governing body of the educational work at the national level. • In january of 2015 started the talks with the Ministry of Education who is investigating the construction of a letter of understanding and as to be able to integrate the Ceremonial curriculum to the mesh intentionally. Permanent changes to the authorities of the Ministry of Education in the Department of San Marcos, it affects the decision-making to conclude with the signing of the letter of understanding between the Ministry of Culture and Sports and the Ministry of Education. We have considered the recommendations laid down by UNESCO December of 2013. The same score the lack of identification of the sources of funding that puts in question the feasibility of the safeguard measures proposed and in this same direction encourages Guatemala to continue their efforts to develop strategies for safeguarding that conform to the financial and human resources available or that it can mobilize. The analysis of the context and conditions of political, cultural and economic, entails a restructuring of the plan to safeguard are prioritized: (a) transmission of the cultural manifestation; (b) the development of the inventory of the cultural manifestation; (c) inform the population about the ceremonial; (d) the recognition and establishment of the space inherent. The Committee Pro Mother Corn, was the first group of carriers of culture, during the process of inventory development were identified other groups in San Francisco Soch, in San Juan del Pozo, who supported in the development of the inventory. Organized the celebration of the cultural manifestation in the dates and places for this. In addition contributed with ideas during the working sessions to develop the document draft submitted to UNESCO. Other groups identified are located in the municipalities of Comitancillo, San Rafael Pie de la Cuesta of the Department of San Marcos, and Nueva Cabrican plantation, Quetzaltenango. Cultural Organizations as a fraternity Shecana organized the celebration of the Ceremonial in the central square of the Municipality of San Pedro Sacatepequez, San Marcos; coordinated the participation in the parade on the fair of the Municipality. Nan Jal Association contributed ideas in the formulation of the document project. The group Pro Corn Mother requested not to work with Nan Jal by financial problems that took years ago. The Academy of Mayan Languages facilitated the analysis of the transmission of knowledge and the construction of a proposal for cultural training. For its part, the Ministry of Education reported to teachers in primary level pre and primary on the importance of the Ceremonial of the P'Aach. The Municipality of San Pedro Sacatepequez, San Marcos for its part had been in all the actions in favor of the ceremonial. The identification of the space and the inherent demarcation with las cruces traditional had a cost of $2,000 . Provided the Committee Pro Mother Corn and the group of San Juan del Pozo a total of $ 1.000 for the own of the ceremonial activities. Gave stipends to carriers of the culture of the group Mother Corn Pro, $200 dollars. Nominated two people paid by the municipal government to accommodate the activities of the ceremonial. AND supported by the organization of work for the inventory. The house of culture has also been supporting with its facilities. The direction of Intangible Heritage is responsible for the technical assistance achieving the support of a person on a permanent basis and two potential for the development: (a) inventory and b) referencing and registration of sacred places. The working meetings regularly are monthly, the communication is also given via telephone and email. Inventory of Intangible Heritage	Registration, systematization, and analysis of the state of the cultural manifestation the Ceremonial of the P'aach. From 01/24/2014 to 07/31/2014	Municipality of San Pedro Sacatepéquez, San Marcos and Ministry of Culture and Sports. US$ 8,000	Municipality of San Pedro Sacatepéquez, San Marcos and Ministry of Culture and Sports. Transmission of the demonstration	Identification, analysis and construction of proposals for the transfer of knowledge from the perspective of the Maya-Mam people. From 01/20/2014 to 4/472014	Guatemala Academy of Mayan Languages. US$ 575.00	Guatemala Academy of Mayan Languages. Meetings with parents and young people in the community the greatness. From 05/5/2014 to 06/10/2014	Committee Pro mother corn. Celebration of The Pregón and the pachitas by Group Pro Mother Corn. From 07/15/2014 to 10/04/2014	Committee Pro Mother Corn. US $ 300.00	Community funds of the women. Celebration of the dance of the pachitas of the brotherhoods of children of San Francisco Soch. 09/28/2014	Women's Group of San Francisco Soch/ parents of the children of the brotherhood. US$ 300.00	Community funds. Celebration of the dance of the pachitas in San Juan del Pozo	01/25/2015	Family of bearers of culture. US$ 100.00	Community funds. The activities carried out during the first year after registered the cultural manifestation in the list of safeguards of UNESCO's urgent, are based on the revision of the request, of the comments made by UNESCO and the socio-political reality, economic and cultural of the communities that maintains the Ceremonial of the P'Aach. This helped to draw a line of work by prioritizing actions that allowed him to build an annual work plan. The above leads us to say that the effectiveness of the activities and the use of the funds available for the action were quite well used. 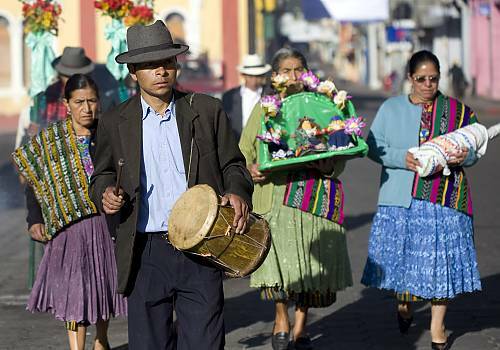 The planned activities yielded the expected results with the exception of the identification of new members of the official proclamation, the manner in which it is drawing the action is inconsistent with the methodology to apply in a natural way the maya-mam to transmit their knowledge. This and the vision to obtain profits by integrating a cultural group, leads to not achieve the expected result. For this reason, we believe that the path will be to inform, train to sensitize the population, so that the population by free decision you want to participate. The funding that was applied to the entire activity of the first year of work comes from the sum of contributions from the bearers of the culture, their communities until the instances by mandate has the binding force. If it is necessary to establish a permanent fund for activities of safeguards by the Municipal Government of San Pedro Sacatepequez San Marcos. From the declaration of the Ceremonial of the P'Aach as intangible cultural heritage of the nation in 2002, the participation of the communities is not clearly defined, the fact that it is a cultural organization that promotes the local is declaratory, leads to displace the carriers of culture in the decision-making. The Ministry of Culture for its part is about to work with these carriers of culture up to more or less the 2007 without that its action is permanent and constant, we must make it clear that for his part, the municipal government does not assume at this stage more accompaniment for the establishment of measures to safeguard the ceremonial. During the construction of the proposed to enroll the Ceremonial in the list of urgent safeguarding, remain the cultural organizations such as local Fraternity Shecana who bear the leadership and intermediated between the Ministry of Culture and the carriers of the ceremonial, at that time only spoke of the committee Pro Mother corn. After the demonstration of registered in the list of urgent safeguarding, picks up the review, analysis and the implementation of the process of empowerment of the carriers of the culture those who start to draw your decision-making in the actions that are performed as part of the safeguard measures. The integral involvement of the carriers of culture it is still a challenge that will face in the year 2015. However, this participation will be ineffective if there are no interinstitutional agreement between local organizations, the municipal authorities and the institutions of central government, this now becomes a second step to resolve in 2015. The application for registration in the list of urgent safeguarding is set according to the dossier on the part of the Committee Pro Mother Corn, by signing the note don Vicente Miranda as a representative of the same and carrier of culture. Support institutions are the Municipality of San Pedro Sacatepequez, San Marcos, Shecana Fraternity, the cultural association organization Comunidad Gay Sampedrana (ACSARE Renaissance. Mention was made of the Academy of Mayan Languages of Guatemala but there is no document of support within the file. The exercise of an open tender since the beginning of the work for the implementation of safeguard measures and the comments of the UNESCO (2013), has been a constant that allows us the active participation of the carriers of culture and the participating communities. The principle of considering the bearer of culture as the leader of the action within the work process has led to certain downs that led in some moments to mediate the situation. Highlights the first that was due to friction between the inter-agency group Pro Corn Mother and Nan Jal Group members Pro Corn Mother request to the Minister of Culture and Sports that are not allowed the entry of this organization in the work. Given the national dynamics, you can't deny any organization which is working in the safeguarding of cultural property, in this case, it means that while Nan Jal does not address issues of specific order with the group Pro Mother Corn, if will participate by contributing ideas and suggestions to the actions that are incumbent upon as part of the organization Comunidad Gay Sampedrana (society. The preparation of the inventory of the Ceremonial of the P'AACH, led to identify other groups of carriers of the culture of communities such as San Francisco Soch, San Juan del Pozo and other groups both within and outside of San Pedro Sacatepequez, San Marcos, who belong to the ethnic group maya-mam. Some members of the group Mother Corn Pro, they were not in agreement with the public presentation of these other groups, which again led us to mediate between the groups of carriers of culture, who also has to be noticed are a dynamic work different from that of the Group Mother Corn Pro, as his gaze is quite community and self-sustainable. There was a cycle of working meetings and during the month of October and December was a review of progress and fulfillment of commitments by the different institutions, in a loud voice and with documents the people established their contribution. Once was with this first exercise was the validation and extension, which as a result this report document.